RMS Queen Elizabeth Cunard Line Ocean Liner Wooden Ship Model 40"
She is the largest ocean liner constructed entirely in the United States and the fastest ocean liner to cross the Atlantic in either direction, retaining the Blue Riband for the highest average speed since her maiden voyage in 1952. Then it has STONIER & C. L LIVERPOOL and 3/1912. 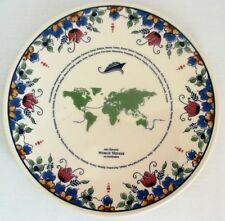 Not even sure if there are reproductions of these dishes. This item is sold in is as is. Subject: Hudson River scene, showing a Cunard Line ocean liner, a French Line pier, and the United States Lines ocean liner SS United States. Date: July 1962. The scan below has not captured all detail, but shows the relative sharpness of the slide. Beautiful image ofNieuw Amsterdam entering NYC. ss Rotterdam. Good Condition. Color Interior & Exterior photos. 8-1/4" x 16" Opened. Approx.4" x 8-1/4". General Information. Foldout Foldout. 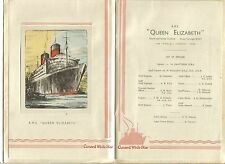 Subject: Cunard Line ocean liner RMS Queen Elizabeth, at Southampton. The scan below has not captured all detail, but shows the relative sharpness of the slide. The green text reading "embitt scan" was superimposed after scanning. You are bidding on one PRINCESS New Grounds Premium COFFEE CARD Unused and Unsigned The card is good for 15 Specialty coffee drinks on any Princess ship (espressos, macchiatos, cappuccinos, iced coffees, lattes, fresh brewed coffee, and specialty hot or iced tea drinks.) The cards will expire on 8-31-2019 but can be used on any Princess Cruise ship until that time. Sadly, I don’t have any cruises booked till after that, so i won’t be able to use them. I have 4 of these. You may buy 1, 2, 3 or all 4. FREE SHIPPING via USPS First Class Mail. Condition is New/unused. Valid thru August 2019. If you can’t use before the end of August, don’t buy it. I ship daily-except Sundays and mail holidays. HAPPY CRUISING! Condition is Used. 1 - Princess Cruises tote bag (New). Subject: View aboard the Cunard Line ocean liner RMS Queen Elizabeth. Date: Sept. 1964. The scan below has not captured all detail, but shows the relative sharpness of the slide. The green text reading "embitt scan" was superimposed after scanning. Subject: Cunard Line ocean liner RMS Mauretania, on the Hudson River. The scan below has not captured all detail, but shows the relative sharpness of the slide. The green text reading "embitt scan" was superimposed after scanning. Heavy piece, maybe silver over bronze/brass. Shows age/use with tiny nicks/dings throughout, no dents. 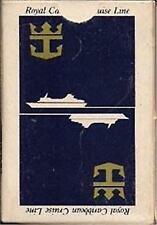 Chester silver mark and Circle mark for Cunard White Star. Note that marks are worn. COPY OF THE RMS QUEEN MARY. Subject: View aboard the Cunard Line ocean liner RMS Queen Elizabeth 2. The scan below has not captured all detail, but shows the relative sharpness of the slide. The green text reading "embitt scan" was superimposed after scanning. Royal Caribbean International Harmony of the Seas Ship Model in Box. New in Box. Flap closure on box missing Condition is Used. Shipped with USPS Priority Mail. Date: circa 1950. The scan below has not captured all detail, but shows the relative sharpness of the slide. The green text reading "embitt scan" was superimposed after scanning. Original 35mm film slide. Rms Carinthia. Cunard Line. Detailed Temporary Deck Plan. Detailed Deck Plan. First & Tourist Class. Tourist Class. Good Condition. General Information. DIRECTLY FROM A 1935 CRUISE SCRAPBOOK. CRUISE LEFT IN MARCH 1935 TO PANAMA AND JAMAICA. BROCHURE TOTALLY LOADED WITH INTERIOR PHOTOS. FEW SCRAPBOOK MARKS ON BACK OF BROCHURE BUT STILL IN ABSOLUTE GREAT CONDITION. Fantastic piece of history, suitable for framing. OFFERED HERE ARE TWO PLACE SETTINGS OF VINTAGE SS UNITED STATES GREY STAR CHINA. ALL PIECES IN GOOD USED CONDITION, WITH THE EXCEPTION OF ONE REPAIRED HANDLE ON ONE BULLION CUP (SEE PHOTO). NO CRACKS. AND ONLY VERY MINOR SCRATCHES. PHOTOS DEPICT CONDITION. ALL PIECES ARE MARKED "MADE EXPRESSLY FOR UNITED STATES LINES". ALL ARE MARKED "LAMBERTON STIRLING" WITH EXCEPTION OF ONE BULLION CUP AND ONE VEGETABLE PLATE WHICH ARE MARKED "MAYER". EACH SET CONSISTS OF EIGHT PIECES (16 TOTAL): 2 DINNER PLATES, 2 SALAD PLATES, 2 BREAD PLATES, 2 VEGETABLE PLATES, 2 BULLION CUPS, 2 COFFEE CUPS, AND 4 SAUCERS.COMPLETE SETS IN THIS CONDITION ARE DIFFICULT TO FIND. This is for 2 sets of Celebrity Cruise Lines Pierced Earrings. Each set has 4 earrings. This comb, from his collection, is a spectacular souvenir piece. Color is beautiful and overall condition is still very good. We believe this is from the 1960's and has MADE IN U.S.A. on the back. Comb opens by pulling on the tab shown in a picture. Cunard Line. Printed by Cunard in the early 1950's. Good Condition. See Photos. Minor splitting. Age appropriate wear. 15" x 20-1/2" Opened. Approx.4" x 9" Folded. Rare brochure, dated Dec. 1932. Unfolded size about 25" x 35". S.S. Berengaria Plan of Tourist Class Accommodations. Obtained from an area estate. Subject: View aboard the Cunard Line ocean liner RMS Queen Mary. Date: June 1959. The scan below has not captured all detail, but shows the relative sharpness of the slide. The green text reading "embitt scan" was superimposed after scanning.